“Almost two centuries past Roger Williams was ejected from Salem, and banished from Massachusetts, for contending for the same doctrine – that rulers, in their official capacity, had nothing to do with religion. The contrary opinion prevailed in the colony [Massachusetts]– that legislatures had a divine right to prescribe religion of the people; and, that magistrates had the same right to judge of doctrines and their tendencies. This claim occasioned the Baptists to be whipped, the Quakers to be hanged, and the witches to be gibbeted. Admit of the principle, that religious opinions are objects of civil government, or in any way under its control, and the broad stair is laid in the case that leads to the inquisition. Admit of the principle, and the rights of the people rest upon the good will of the legislature, and the benevolence of towns; whereas, they ought to rest upon a footing, out of the reach of the ill will of the legislature, and the malevolence of towns. Though the tree may be hewn down, yet, the just liberty of the people is not secure, while the stump is preserved with a band of iron and brass. For more on Leland see my early post on him. 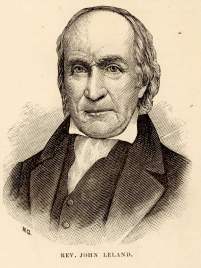 John Leland, The Writings of the Late Elder John Leland: Including Some Events in His Life, edited by L.F. Greene (N.Y. 1845), pp. 506-7.